Perhaps you recall the row in Leinster House in December 2012 between our Taoiseach Enda Kenny and Gerry Adams over the 1972 disappearance and murder by the IRA of widow and mother of 10, Jean McConville? Frankly, this is what the country now requires from our leader with regard to the disappearance, death, and dumping of 800 infants and children from the former mother-and-baby home in Tuam and for every other mass grave on or near the grounds of every other former mother-and-baby home throughout Ireland. To that end, the Taoiseach should, without delay, declare the Government’s intentions on the scope, speed, and plan of analysis for a full-scale national inquiry into how (at best) several hundred infants and children died of entirely preventable ailments while in the so-called care of State-funded, Church-run homes, in which the Church and State co-operated in incarcerating pregnant women and girls simply because they were unmarried. At worst, we may be viewing systemic instances of infanticide and/or neglect not just at one such home but repeated throughout others, because the people paid for and tasked with caring for these vulnerable but ultimately invisible children regarded them as sub-human because of their non-marital status. 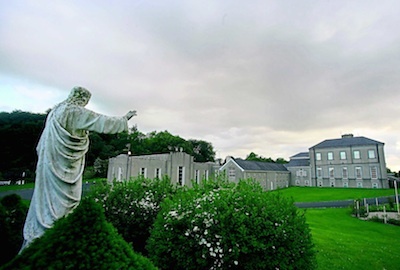 The operators of these homes, were by and large congregations of female religious orders invited to Ireland by local archbishops (as was the case for the Bons Secours order of nuns who ran the home in Tuam), by the primate of Ireland, archbishop John Charles McQuaid, or by the Irish State itself to deal with the problem of unmarried mothers. The main concern of the Catholic Church’s hierarchy was at all costs to prevent the emigration of these women and girls to England where their children might be adopted into protestant homes -- so thus began the State-sanctioned and funded system for incarcerating unmarried, pregnant women and girls in walled institutions where their sexuality would not offend or contaminate Catholic morals. The majority of the inmates of these wretched homes recall a harsh, cruel, punitive, dehumanising regime where they were stripped of their clothes, names, identities, self-esteem and self-determination. A class system often prevailed so those from poorer backgrounds were given the worst jobs and remained the longest at these homes, potentially for up to four years, to work off their penance. What most never realised was that the nuns tendered for the business of running these homes and received very generous government funding, equivalent to the average industrial wage, for each mother and child in their so-called care. In addition, they profited handsomely from the forced adoptions they transacted, which saw 97% of all non-marital children taken for adoption in 1967. With that knowledge it is unconscionable that the youngest babies, who should at least have been breast-fed by their mothers, could have died of malnutrition as is revealed on some of the death certificates meticulously uncovered by local Galway historian Catherine Corless in relation to the Tuam grave pit. A potential explanation can be found in the account given by the late June Goulding in her book The Light in the Window, on the Bessborough mother-and-baby home in Cork, where she worked as a midwife from 1951-52. She recounted being shocked on discovering the nun in charge of the new mothers insisted on an ad hoc system of wet-nursing where children, rather than being fed by their own mothers, who may have been working elsewhere in the home, were instead assigned to a random lactating mother to be fed. June Goulding, a young midwife, found this practice repellent and quickly grasped that it was part of the dehumanising regime designed to break down the women so they were incapable of questioning the nuns’ supreme authority. A closer examination of the death certificates to reveal the exact ages of the youngest babies who died and a correlation with their personal files, now in the hands of the HSE, is essential at this juncture to see if any congenital disability or frailty was noted for these children at birth and what, if any, specialist medical treatment the nuns obtained for them. If evidence exists that conditions remained deliberately untreated, we need to know. Catherine Corless also found evidence of older children in the Tuam home dying from entirely preventable infections. Other newspapers have reproduced extracts of reports from local inspectors who noted that many of the children appeared to be showing the outward signs of malnutrition and neglect. Yet the home was allowed to continue operating. Such neglect is inexplicable as most of these homes had small holdings, growing their own produce and raising livestock. Initial research suggests that this systemic neglect of non-marital children was not contained to just the home in Tuam and suspicions arise in relation to at least three other large mother-and-baby homes, where mortality rates topped 56%, when the national average for marital children only reached 15%. Most astonishing among this carnage is that stories of care and nurture exist for the occasional marital child who grew up in the Tuam home. In particular, for the baby son of a widower who lived in the Tuam house for many years when his father worked at the home. He recalls no brutality and can remember gifts brought to him by Santa Claus. Evidently, the nuns did not lack the training or knowledge of how to care for children; they deliberately chose to ignore the humanity of the “illegitimate” children in their care, which Irish society, Church and State collectively, despised. Once again, the world watches on with incredulity to hear that several Irish government ministers, not least former children’s minister Frances Fitzgerald, have known of these mass graves, have known of the brutal circumstances of the deaths of those dumped in pits rather than interred in proper graves for some time, and yet once again the regime can find no words of horror, remorse, compassion, or explanation, and worse, seem intent on minimising any investigation to the status of an “interdepartmental inquiry”, ie a superficial slew of imprecise reports. The news that the gardai, without any exhumation of the bones, without any forensic analysis, have baldly declared that they do not intend to carry out any investigation suggests the old entrenchment of a government in fear of what might be revealed. To our Taoiseach, I ask how long must these victims of our collective inhumanity and their families wait “to hear you speak the truth about some elements of our past”? Or is justice to be denied the despised in death as it was in life?